Harry Redknapp's first competitive return to Dean Court ended in defeat as 10-man Bournemouth beat his QPR side. In damp conditions on the south coast, Tommy Elphick headed the Cherries in front following a corner, but Armand Traore levelled soon after half-time. Lewis Grabban fired in from close range to restore the home side's lead, before Harry Arter was shown a straight red card for a lunge on Junior Hoilett. But QPR found no reply and slipped 10 points behind second-placed Burnley. A fourth successive victory for Bournemouth leaves them as one of four teams five points behind Reading, who occupy the final play-off position. Redknapp began his managerial career with the Dorset club in 1983, spending nine years in charge and taking them to the second tier for the first time in their history. But his hopes of taking QPR back into the Premier League took a knock with his third-placed team now only three points ahead of Wigan in fifth. Bournemouth goalkeeper Lee Camp made impressive saves to deny Jermaine Jenas and Ravel Morrison, but the Cherries should have taken the lead when Grabban squared for Yann Kermorgant, only for Rangers goalkeeper Rob Green to make a fantastic point-blank stop. But the hosts did go in front in first-half stoppage time, when skipper Elphick nodded home Ian Harte's right-wing corner. The visitors responded in emphatic fashion after the break as on-loan Tottenham midfielder Tom Carroll lofted a delightful ball into the path of Traore, who juggled to the byeline before firing smartly past Camp. Bournemouth rallied, with Grabban slotting home his 20th goal of the season, but they were reduced to 10 men when Arter was dismissed after going in high on Hoilett. Despite their numerical advantage, Rangers needed Green to prevent further damage with saves from Andrew Surman, Grabban and Harte. The visitors' Richard Dunne then had a header cleared off the line in the final seconds, but Redknapp left with no reward. "It is a terrific achievement at this level [to score 20 goals] when you look at the names he is up there with and I still feel there is more to come from him. "I cannot deny there is still a chance for us to get in the top six and Tuesday against Reading is going to be a very special game." "I don't think it was a red card. It is not a tackle Harry had to make but it was not two-footed." "It [automatic promotion] is almost impossible now, to be fair. Nobody is going to catch Burnley now are they? "I thought we started great and played some really good football and then we began to give it away. I thought we would go on to win. "We lacked that bit of flair to open them up. You are looking at a bit more from Junior Hoilett and Ravel Morrison, your flair players to open them up - and they didn't really do it." Match ends, Bournemouth 2, Queens Park Rangers 1. Second Half ends, Bournemouth 2, Queens Park Rangers 1. Attempt missed. Bobby Zamora (Queens Park Rangers) header from the left side of the six yard box is high and wide to the right. Assisted by Benoit Assou-Ekotto with a cross following a corner. Attempt blocked. 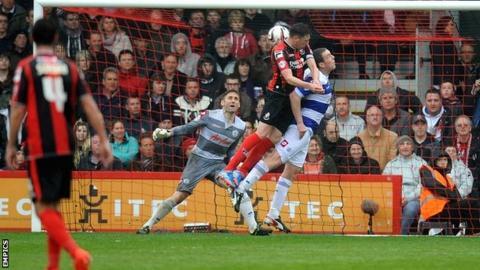 Richard Dunne (Queens Park Rangers) header from the centre of the box is blocked. Assisted by Benoit Assou-Ekotto with a cross. Substitution, Bournemouth. Brett Pitman replaces Marc Pugh. Corner, Queens Park Rangers. Conceded by Eunan O'Kane. Corner, Bournemouth. Conceded by Robert Green. Attempt saved. Ian Harte (Bournemouth) left footed shot from outside the box is saved in the top centre of the goal. Richard Dunne (Queens Park Rangers) is shown the yellow card for a bad foul. Attempt saved. Lewis Grabban (Bournemouth) left footed shot from the left side of the box is saved in the bottom right corner. Assisted by Ryan Fraser with a through ball. Corner, Queens Park Rangers. Conceded by Marc Pugh. Attempt missed. Junior Hoilett (Queens Park Rangers) left footed shot from the centre of the box is just a bit too high. Assisted by Charlie Austin. Ravel Morrison (Queens Park Rangers) is shown the yellow card. Corner, Queens Park Rangers. Conceded by Simon Francis. Substitution, Queens Park Rangers. Bobby Zamora replaces Armand Traore because of an injury. Hand ball by Marc Pugh (Bournemouth). Ian Harte (Bournemouth) is shown the yellow card. Foul by Tom Carroll (Queens Park Rangers). Attempt missed. Charlie Austin (Queens Park Rangers) header from the centre of the box misses to the left. Assisted by Danny Simpson with a cross. Substitution, Queens Park Rangers. Yossi Benayoun replaces Jermaine Jenas. Attempt blocked. Lewis Grabban (Bournemouth) right footed shot from outside the box is blocked. Assisted by Eunan O'Kane. Harry Arter (Bournemouth) is shown the red card. Danny Simpson (Queens Park Rangers) wins a free kick in the attacking half. Substitution, Queens Park Rangers. Charlie Austin replaces Modibo Maiga. Attempt saved. Harry Arter (Bournemouth) right footed shot from the left side of the box is saved in the top centre of the goal. Hand ball by Benoit Assou-Ekotto (Queens Park Rangers).